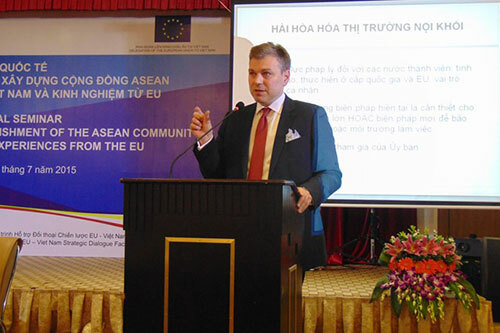 City legal academic speaks about harmonization at EU-Vietnam seminar in Da Nang. Professor Panos Koutrakos, Professor of EU Law and Jean Monnet Chair in EU Law, participated in a two-day international seminar on “Legal Harmonization in the Establishment of the ASEAN Community – Issues for Vietnam and Experiences from the EU”. Professor of European Union (EU) Law and Jean Monnet Chair in EU Law, Professor Panos Koutrakos, participated in a two-day international seminar on “Legal Harmonization in the Establishment of the Association of South East Asian Nations (ASEAN) Community – Issues for Vietnam and Experiences from the EU”. The ASEAN community is a political and economic organisation of ten Southeast Asian countries. It was formed on 8th August 1967 by Indonesia, Malaysia, the Philippines, Singapore and Thailand. Its membership has since expanded to include Brunei, Cambodia, Laos, Myanmar (Burma) and Vietnam. Its aims are accelerating economic growth, social progress and sociocultural evolution among its members, protection of regional peace and stability, and opportunities for member countries to resolve differences peacefully. The seminar took place in Da Nang, Vietnam on 16th and 17th July and was organized by the Office of the National Assembly of Vietnam in cooperation with the European Union Delegation to Viet Nam through the EU-Viet Nam Strategic Dialogue Facility. It brought together EU and ASEAN experts and Vietnamese practitioners, scholars and representatives of different agencies to exchange experiences and ideas on legal harmonization and issues related to Vietnam in the context of ASEAN integration. Professor Koutrakos presented two papers, one on the history of legal harmonization in the EU and the other on harmonization in the area of tobacco advertising. Professor Helen Xanthaki, from the Institute of Advanced Legal Studies at the University of London, also made a presentation at the seminar about transpositions and policy/law formulation for the implementation of the European integration process approach to legal harmonisation. For more information on the seminar please visit this weblink. Legal harmonisation in the context of the EU is a policy aimed at achieving uniformity in the laws of member states in facilitating free trade and the protection of citizens.